For foreign patrons Japan’s small town markets, like the Yamagata Fureai Market in Sendai, offer more than just a taste of the local produce, they offer the kind of welcome that makes them feel like one of the locals. I would like to say that I stumbled upon the Yamagata Fureai Market with no foreknowledge but that would be false. A news broadcast the previous evening had given me all the details I needed. 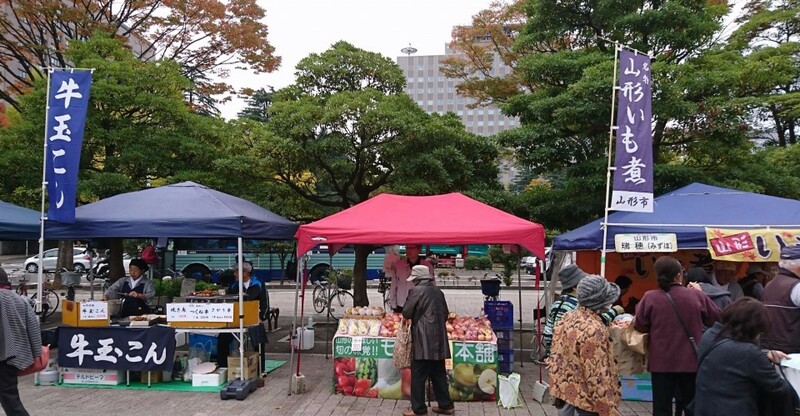 Some kind of market was going to be open from 10AM at Kotodai Koen in Sendai, but my Japanese level is far from expert, so many details remained obscure. What would be sold there? By whom? The best way to find out was to witness the event first hand, so I trudged off to the Sendai in the early morning hours, ready to see what all the fuss was about. To my delight, this Yamagata Fureai Market was the part-farmer's market, part-craft's fair that I have come to love in many of my former locales. In North Texas, the smaller city of Weatherford holds a similar event called First Monday, where one could buy a number of things including live poultry if memory serves, though most of the products were farm-fresh items including produce and eggs. 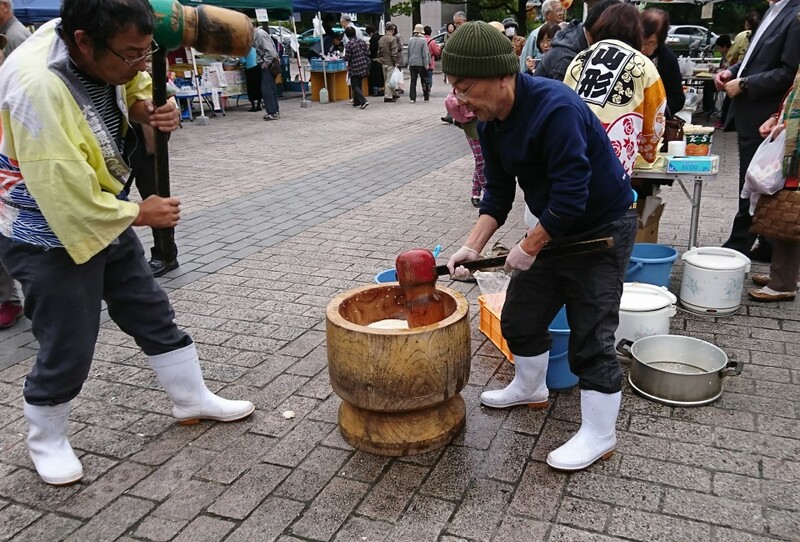 In Gifu, the very small city of Nakatsugawa is home to the same kind of event, the first weekend of every month, though they did have more to offer in the way of woodworking and fresh yakitori without the farm animals as I recall. The Yamagata Fureai Market differed from these previous marketplace experiences somewhat in that there was basket-weaving in the place of Nakatsugawa's woodworking and in the center of the market, a line of people spiraled out from a pair of men, smashing rice into mochi rice cakes before our eyes. Some stalls around the marketplace offered other ready-food options, though most of the tables were filled with produce of one kind or another. With the relatively high cost of fruit in Japan, one could hardly ignore apples of great size for less than 100 yen each, especially when the booth also granted free samples. Some pomegranates in one booth caught my eye, as did a few of the baskets and other wooden crafts in the one handicraft booth present. After some window shopping and careful consideration via sampling, I acquired a jar of delicious chestnut-flavored honey and with it, several tickets for the mochi experience. The line coiled slowly around the center as two men continued to hammer the steaming rice with a large mallet until the squishy results proved firm enough to distribute. A couple of assistants took over then, sneaking away with the ready pile of mochi to separate it by the handful. The clumps were then cast into a kinako powder mixture on a nearby table. 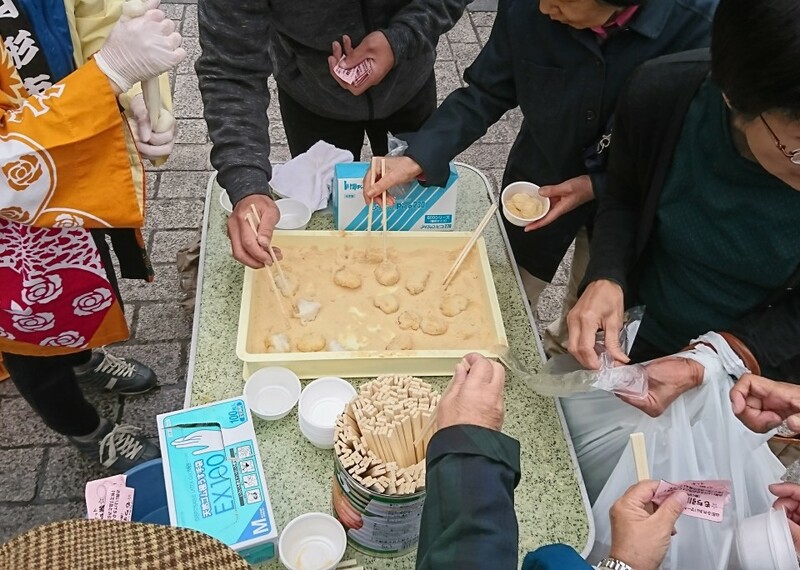 Patrons were given the opportunity to take up to two rice cake balls per ticket. Small plastic containers and chopsticks were provided and I hastily snatched away four of the tasty little morsels. I was overjoyed to find that the kinako powder, which I generally find palatable but bland, included a dash of salt which brought the flavor into a new, enjoyable light. While this isn't the first monthly market I have ever been to, nor the biggest, it was certainly a lovely reminder of one of the very best things about Japan - the people. Each person I interacted with treated me with the same respect and courtesy they granted everyone else. There was no overblown gesturing at price tags or calculators and no assumptions that whatever little English they may know must exceed my Japanese ability by default. Instead, there were a few short but fruitful attempts at small talk followed by purchases and fun. Small town markets like this give the casual foreign observer the chance to sample local produce, support local industry and even practice a little Japanese if they choose to. Should you be in Sendai on Wednesday Nov. 9, the Sendai Fureai Market will be held again, without the mochi event, in front of Green House, a venue somewhere between Tsutsujigaoka and Sendai stations on the Senseki line.